WORCESTER, Mass.—None of the stars from the "Fierce Five," the highly meme-able gold medal team from the London Games, competed in Worcester for the American Cup last weekend. The American Cup is the only international gymnastics competition held in the U.S., but these girls are still on the final leg of London promo: Aly Raisman just signed on as a cast member of Dancing With The Stars, 17-year-old Gabby Douglas has been busy promoting her memoir, and McKayla Maroney has twice appeared on the CW's Hart of Dixie. Only Kyla Ross, the team's quietest member, has returned to the gym to resume high-level training since London. But even Ross, sidelined with a bruised heel, had to withdraw from the Cup. Truthfully, their absences didn't matter much. The year after the Olympics is all about new talent, and that's especially true for women's gymnastics, where the athletes seem to age in dog years. In 2009, the American Cup introduced NBC viewers to a then 13-year-old Jordyn Wieber, who quickly supplanted Shawn Johnson as the Americans' power tumbler. And this year, Katelyn Ohashi and Simone Biles—two young female stars poised to take over for Douglas, Raisman, and Maroney at the top of the elite heap—emerged as the sport's American successors. This is gymnastics' version of the "circle of life," minus the Elton John/Tim Rice treacle: Every four years, the rules and the athletes shift and a new crop of ponytailed talent ascends. 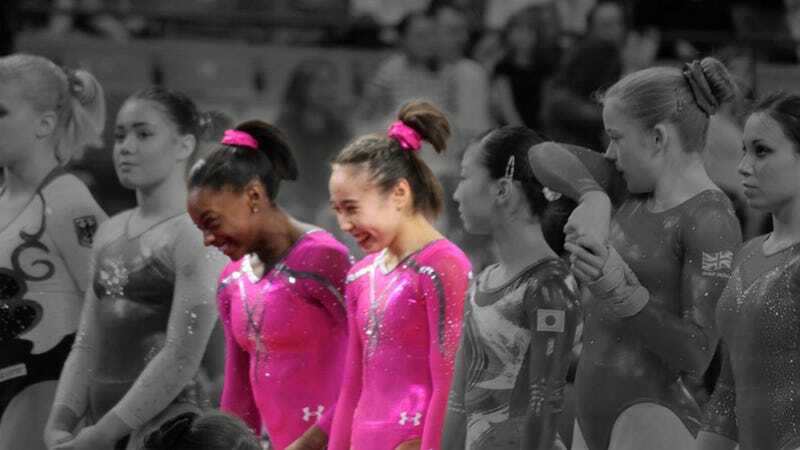 Ohashi and Biles are both 15 and from Texas. (If gymnasts were an exportable item, Texas would lead the country in domestic production.) Ohashi was the 2011 junior national champion and the 2012 Pacific Rim all-around gold medalist in the junior division, and she's been expected to take over for Team USA for some time now. (It helps that her coach is Valeri Liukin, father to 2008 Olympics all-around champion Nastia, and an Olympic and world gold medalist in his own right.) She has one of the most difficult beam routines in the world—for juniors or seniors—and is well balanced on the other events, showing some intricate pirouetting skills on the uneven bars. But Biles nearly outshone her this weekend. The 4-foot-8 block of muscle took the top score on the uneven bars (her weakest apparatus) and led at the halfway point. Biles still lacks experience in international competition (Ohashi outpaces her in this regard), and nerves seemed to get the best of her when she fell off the balance beam. When you watch the 15-year-old on all four events, you're struck by how much potential Biles has, and she'll only improve over the next couple of years if she avoids injury. It is on the power events, vault and floor, where Biles is beginning to dominate. She has one of those spectacular and difficult Amanar vaults, the 2.5 twister that made Maroney famous before she was known for making sour faces during medal ceremonies, and Biles's may even rival Maroney's version. (I saw Biles stick an almost flawless one in warm-ups moments before she competed in Worcester.) She's also rumored to have completed a triple twisting version of the vault in training, so she and Maroney are in an unofficial race to be the first to land it in competition. Either way, the U.S. still has vault supremacy over Russia or Romania going into the next Olympic cycle. Biles's tumbling, which would be extremely difficult even for more experienced gymnasts, seems easy for her, and she'll certainly upgrade it in the near future. (She told reporters that she's working on adding a full twist to her second pass.) On bars, she debuted a new release skill, she's got a new dismount series on beam, and her vault ability is already where it needs to be. Her ranking is really just an afterthought; she should play a big role in her team's success in Rio. This, really, is the lesson of competition in a post-Olympic year: results don't really matter. There isn't even a full world championships scheduled for this year—there will be individual events, but no team competition. Gymnastics is a sport oriented towards the Olympics. Winning the year after the Games is like winning every preseason baseball game: This is only the first stretch of what amounts to a four-year marathon, but Biles and Ohashi may have a head start. Photo by Brigid McCarthy for The Couch Gymnast.